For those of you unfamiliar with this event, the Rally to Restore Sanity is a major event in Washington, DC. It is hosted by Jon Stewart of the Daily Show, and is a rally for people like me who don’t like the political extremism we’ve seen in this country lately. 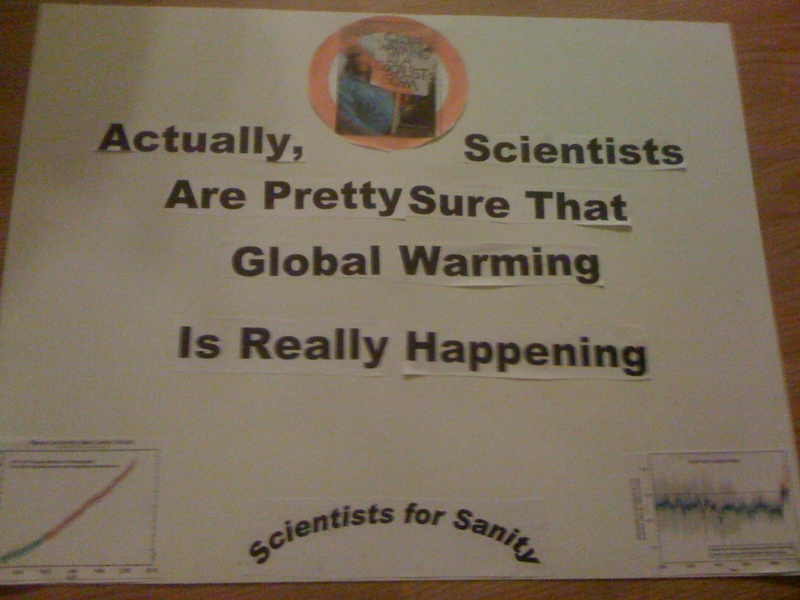 In case you can’t read it, my sign features a Tea Party protester claiming that “Global warming is a socialist scam”, along with the words “Actually, scientists are pretty sure that global warming is really happening”. It also features the Mauna Loa CO2 graph, the Mann hockey stick temperature graph, and the words “Scientists for Sanity”. Charlie will be joining me, and he’ll have a Scientists for Sanity sign of his own. I hope to see some of you there, but if you can’t make it, you can follow the action live on Comedy Central from 12-3, and it will be live-tweeted with the hashtag #Rally4Sanity. Have fun at the rally. I’d be interested to hear your thoughts about the value of events like this when you return. My perception of both the sanity rally and the glen beck rally is that the do little except make the people who attend them feel good about themselves. People like to validate their positions with social proof; they like the feeling that they’re not the only person in the world who ‘gets it’. Someone should calculate the carbon footprint of the rally, just for kicks. Well, I’m primarily going because I’m a big fan of Stewart and Colbert, the event should be hilarious, and I have friends in DC that I havent seen for a while. I don’t expect this event to change the world, but it does (temporarily) drive the media narrative away from stories about how much more fired up the far right voters are about the midterms. Getting people excited about voting just may make the difference in one or more close races. Growing ever more frustrated with the anti-science GOP candidate positions, I’ve been wondering if there is a Scientists for Sanity movement going on anywhere and found your post from last year. Anything since then? I’m a PhD student, too. We scientists need to make a hell of a lot of noise, very soon, or we’re going get one of these bozos for President. Dark Ages II is just one election away. This wasn’t a movement so much as a snappy title for a blog post… sorry Kathy. Union of Concerned Scientists is probably your best bet.